It’s an event that will go down in history: the Great Oscar Debacle of 2017. 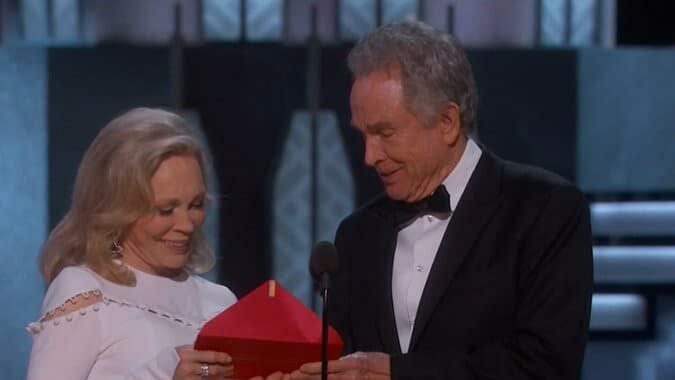 Nobody could possibly forget that fateful moment when Faye Dunaway attempted to regroup from a dazed and confused Warren Beatty reaction to being handed the wrong envelope and announced the wrong winner of the Best Picture award. In an unprecedented occurrence, La La Land was given the Oscar for an award that they actually didn’t win. Here’s what happened. As the epic Oscar awards evening was drawing to a close, viewers, celebs, and crew were all waiting anxiously to learn who would walk away with the coveted Best Picture award for 2017. It was a close call, with Moonlight and La La Land rallying support. Warren Beatty and Faye Dunaway took the stage to announce the winner. Beatty opened the envelope, and that’s when havoc set in. Clearly there was some mistake as the confusion set in on Beatty’s face was almost tangible. He handed the envelope over to co-announcer Dunaway, but she was no better at deciphering the mix up. In a quick effort to save Oscar face in front the cameras and 32.9 million viewers, Ms. Dunaway announced La La Land as the winner based on the information she had in hand. But even as the jubilant producers and cast took the stage to claim their unearned award, commotion ensued backstage. Reporters, execs, and most of all Brian Cullinan of Oscar-card-responsible-PricewaterhouseCooper, dove into a frenzied discussion about what to do next. It wasn’t until Fred Berger, the third La La Land producer, took the mic to speak that the mistake confirmed. At this point, Berger rallied admirably, announcing that in fact, they hadn’t won, and handing the stage over to a befuddled Moonlight producer Barry Jenkins. After some discussion about the evening, here’s what experts think happened. Fact: Two sets of envelopes are printed by PwC containing the winner of each award category, meaning two sets of Best Supporting Actor, Best Musical, Best Foreign Film, etc. One set is given to the stage manager on the right side of the stage, and the second set is given to the stage manager manning the left side. Whichever side of the stage the announcer comes from, that manager hands off the winning envelope. Normally, the second one is discarded without fail. The first envelope for Best Actress was handed off to Leonardo DiCaprio. He announced Emma Stone’s award without a hitch. But then what happened was this: When Warren Beatty took the stage from the opposite side of the stage, he was handed the second envelope containing the same Best Actress award for Emma Stone. So when he went on stage to present the Best Picture award, all he saw was Best Actress, Emma Stone, La La Land. Thinking the heading was wrong, Faye Dunaway wrongfully presented the award to La La Land, and the rest is history…forever. Regardless of what actually occurred that night, one thing’s for certain: PwC’s breach time response was horrendous. Normally, when a security breach of any sort happens, all involved parties are notified immediately. This is true whether you’re dealing with high-end security firms or HIPAA health regulations. PwC took far too long to get their act together and notify the appropriate parties to take action. For such a high-profile assurance firm, they really ought to have better response times than they demonstrated at the Oscars. It was a mistake that had never before happened in the 89 years of Academy Award history, and after last night, it’s unlikely that it will happen again anytime soon. Ironically enough, PwC firmly believes in the importance of a strong and comprehensive compliance framework for any business. Maybe if PwC had used a service like Streamline Verify, this disaster never would have happened. Streamline Verify is an expert at getting rid of duplicates, so nobody, not even Beatty, is left stuttering ;-).